How Does the GMC Yukon Measure Up Against the Nissan Armada? The full-size SUV segment is somewhat precarious when it comes to the changing face of today’s automobiles. On the one hand, they remain a throwback to oversized vehicle footprints of yesteryear in today’s more modestly-sized, eco-friendly world. On the other hand, they depict a sense of aspirational opulence that allows automakers to try their hand at challenging entry-level offerings from luxury competitors. If neither of those characteristics appeal to you, well…you might be reading the wrong article. But if you like the idea of a spacious, confidently powered and amenity-rich street-tank, well, most every automaker has something to offer up. But while the likes of Chevy’s Suburban and Ford’s Expedition continue to rule the roost in terms of domestic offerings, some of the best offerings could be described as ‘sleeper hits.’ Since two near-perfect examples of this have been served up by GMC and Nissan, respectively, let’s take a closer look at the 2018 GMC Yukon vs 2018 Nissan Armada and see how they measure up against one another. Offering seating for up to nine passengers the Yukon is served up in four trim levels (SLE, SLT Standard, and SLT along with the high-end Denali trim). It is also broken down between the original Yukon, and the upsized XL variant. Priced to start around $49,100 MSRP the Yukon features two different powertrain options (depending on trim) leading to impressive power and utility ratings (which we’ll dive into deeper, later on). That said, the Armada measures up in almost every one of those regards. The four available trim levels (SV, SL, Platinum and Platinum Reserve) are priced to start around $46,090 MSRP. With available seating for up to eight passengers, it offers up competitive numbers in terms of power and utility as well. That said, in terms of basics, there just aren’t enough differentiators to rule either a solid leader. 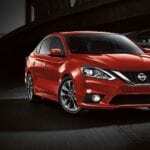 Sure, Nissan offers a slight advantage in terms of starting price point, but any distinction goes away once you begin to customize or jump trim levels. Also, any advantage seems minimized by GMC’s offering of both versions of the Yukon, with the XL offering up to two-feet of additional length, more than twice the cargo volume behind the third row, and over 33% more third-row legroom. That said, let’s dig deeper. Aside from the Denali trim, all Yukons are powered by a 5.3-liter EcoTec3 V8 engine paired to a 6-speed automatic transmission that channels 355hp and 383 lb-ft of torque, while earning the best V8 fuel economy in its class (16 city/23 highway). When properly equipped, it can tow up to 8,500 LBS delivering a solid performance overall. Regardless of whether you choose the Yukon or Yukon XL, the Denali trims come powered by a 6.2-liter EcoTec3 V8 paired with a 10-speed automatic transmission. Wrangling 420 horses and 460 lb-ft of torque, it’s hard to argue Denali’s appeal in terms of upgraded performance alone. Switching gears, the Armada (across trim levels) is powered by a 5.6-liter 32-valve V8 which delivers 390 hp and 394 lb-ft of torque. Like the Yukon, it is available in both 2WD and 4WD variants, and (when properly equipped) can tow up to 8,500 LBS. While an able performer capable of outperforming the Yukon at the base trim level, the absence of a upgraded engine configuration leaves it somewhat lacking to those, who prefer a hi-po’d option. Acknowledging the subjective nature of any discussion of aesthetics, both the Yukon and Armada feel like appropriate depictions of their respective pedigrees. The Yukon, for example, enjoys the thunderous bulk expected of full-size domestic offerings. Almost carrying a connotation of government agencies, military, and organized crime groups, its visual calling card is an imposing, threatening nature. On the other hand, the Armada boasts the familiar front fascia of today’s Nissan offerings while serving up a refined silhouette, which distinctive contouring and accents which lends it a sleeker, high-end look. That said, the execution of Nissan’s design philosophy in the Armada feels simultaneously consistent and distinctive. If the Yukon can be equated to a blunt instrument, the Armada could be equated to a scalpel. On exterior design alone, we feel the Armada takes this one. At this price point, it’s unlikely that either the Yukon or Armada will let you down in terms of a cabin experience. Both are spacious, providing ease of entry and exit, along with sufficient head and leg room. Both are constructed of strong material choices and tastefully designed. That said, neither are breaking new ground (in our opinion), meaning that it really comes down to personal preference. As alluded to in discussing the in-cabin experience, neither offering is going to disappoint you in terms of tech-centric amenities. After all, in a segment defined by its kitchen-sink approach to satisfying every demand a driver or passenger could have, the line-toppers are bound to come out swinging. Both offer intuitive control placement with responsive touchscreen interfaces. Both offer Bluetooth connectivity, smartphone integration and the option of 4G LTE Wifi. In this day-and-age, that ticks the majority of the core ‘boxes’ when speaking of evolved expectations. With antilock brakes and the StabiliTrak electronic stability control system, the Yukon instills confidence in any driver who sits behind its wheel. Equipped with seven (front, front center, side-impact, and head-curtain) airbags, passengers can claim the same. That said, the Yukon also offers the option of OnStar monitoring, making it compelling even at the base trim. Jump trim levels and you’ll find the option of additional safety and driver assist features such as low-speed automatic braking with forward collision alert, and lane keep assist with departure warning. The Armada offers equal assurance in terms of preventative features, with comparable safety features courtesy of Nissan’s Intelligent Safety Shield Technologies. That said, it’s worth noting that four of the ten different technologies incorporated into Nissan’s offerings earn “class-exclusive” status including forward collision warning, back-up, and blind spot intervention and 360-degree visibility thanks to the Intelligent AroundView monitor. The best way to compare the 2018 GMC Yukon vs 2018 Nissan Armada is to go out and drive each. Only you can decide for sure, but either way, you’re bound to be satisfied. From the second you sit in the seat until you give the keys back, if you give them back, you should feel drawn to one of these. Look for dealers in your area that offer these great SUVs and get behind the wheel today. That said, which would you choose? Next post: 2018 Chevy Equinox vs. 2018 Hyundai Santa Fe Sport – Who Gets The Job?